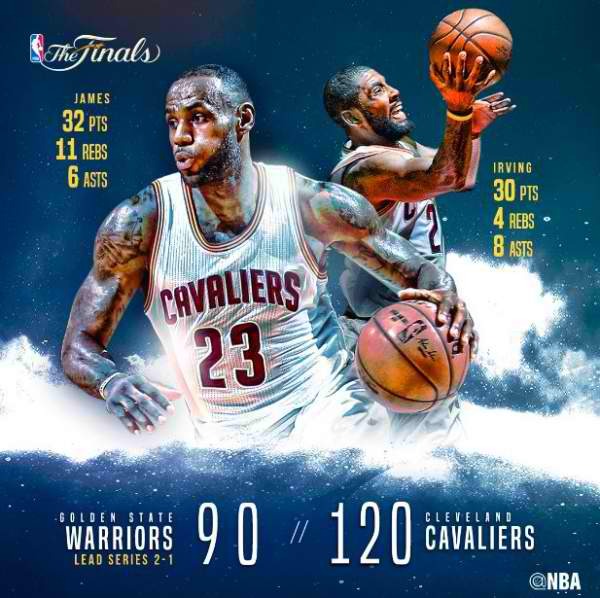 Game 3 Highlights: Cavaliers dominate Warriors 120-90 (2016 NBA Finals) - Balita Boss! On their home floor, the Cleveland Cavaliers dominated the Golden State Warriors, 120-90, in Game 3 of the 2016 NBA Finals. LeBron James led the Cavaliers with 32 points and 11 rebounds. Kyrie Irving added 30 points, 16 in the first quarter. Kevin Love missed the game due to concussion protocol after absorbing a Harrison Barnes elbow in Game 2. J.R. Smith, with his best game of the series, contributed 20 points, and forward Tristan Thompson controlled the paint with 14 points and 13 rebounds. Two-time MVP Stephen Curry and his All-Star backcourt mate Klay Thompson had another substandard game. Curry finished with 19 points but only had two points at halftime. Thompson missed his first five shots, was forced to head to the locker room in the first half after bumping knees with Cavaliers reserve Timofey Mozgov, and finished with just 10 points. Harrison Barnes scored 18 points for Warriors. The Golden State still lead the best-of-seven series 2-1. Game 4 is Friday night in Cleveland (Saturday morning in the Philippines.